Purpose: In this tutorial you will find some benchmark calculations for testing the convergence of the elastic constants of Si in diamond structure as a function of parameters such as the k-point mesh and rgkmax. In addition we will benchmark the diamond as well. 9. Elastic constants of diamond vs. the k-point sampling. Very important: We suppose you already set up all the variables and executables as described in Section 1. of the tutorial Energy vs. strain calculations. We will consider here as test case Silicon in the cubic diamond structure. The calculations will use the LSDA functional for the exchange-correlation term. We will use as cubic lattice constant the value a=10.210 bohr (as can be verified using the tutorial Volume Optimization for Cubic Systems). For the moment, we keep constant the value of the rgkmax cutoff (see Input Reference for more details) to rgkmax=7.0. Furthermore, we include structure optimization letting the internal positions of the atoms relax upon deformations. where the variable EXCITINGROOT must be substituted by its actual value (see, e.g., the tutorial Energy vs. strain calculations). In this directory workdir-KP4x4x4-st1 one executes SETUP-elastic-strain.py, choosing 0.1 for the maximum strain value and 21 for number of strains. This means that our structure will be deformed according to Lagrangian strain up to a maximum (minimum) value of 0.1 (-0.1) and within these limits 21 equally spaced deformations will be generated. The last entry to be given is the deformation code. We choose the code 1, (equally we could have chosen the equivalent codes 2 or 3 for cubic systems) that is directly related to the C11 elastic constant. The computations for this deformation code are more demanding than for the code 0 (volume optimization) and less demanding than the code 4 (for the C44 elastic constant). After running the script, a directory called workdir is created, which contains the input files for the different strain values. To execute the series of calculation with input files created by SETUP-elastic-strain.py you have to run the script EXECUTE-elastic-strain.sh. After the complete run, the results of the calculation for the input file workdir/input.xml-i are contained in the subdirectory workdir/rundir-i where i is running from 01 to the total number of strain values. 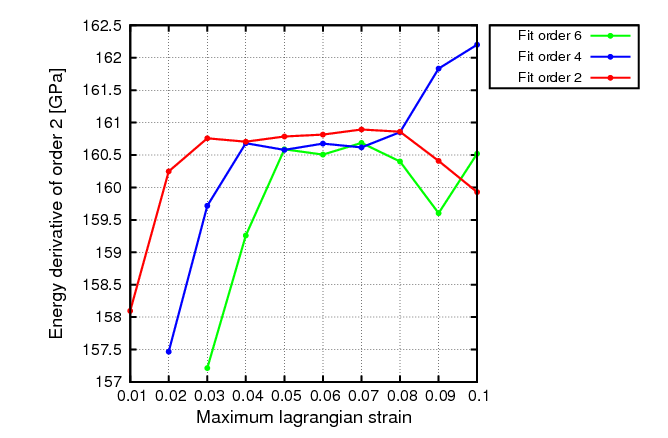 The data for the energy-vs-strain curves are contained in the file workdir/energy-vs-strain. In a very similar way, you can proceed for calculations for the deformation codes 0 and 7. We move now to the directory workdir. Here, we execute the script CHECKFIT-energy-vs-strain.py and enter 0.1 for the maximum strain and 2 for the second derivative of the energy (this choice correspond to the calculation the linear elastic constants). As a output, one gets the values of the second derivative of the energy for the maximum strain of 0.1, obtained using polynomials of different order for the fit of the calculated data. 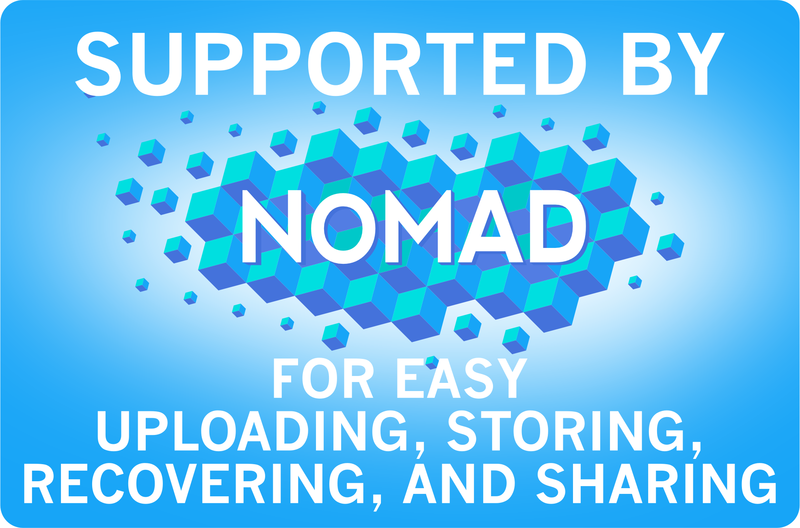 The script produces also a PostScript output in the file gnu.ps. In this example, we get 156.7 and 164 GPa from the 4th and 6th order of the polynomial used in the fit, respectively. We can repeat the execution of this script and change the range of the strains to be used (e.g., setting the first entry to 0.05, we take into account only values of -0.05, -0.04, …, 0.04, 0.05). The results of the fitting procedure can be visualized using gnuplot in order to estimate the value of the second derivative of the energy (here, it is directly C11 in GPa). 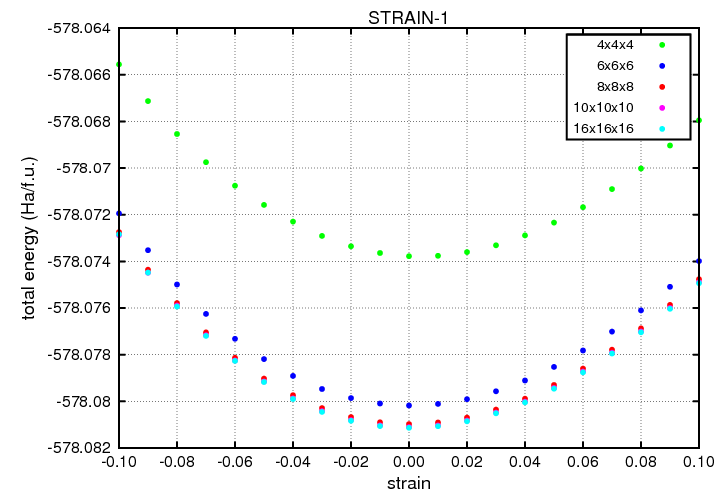 See the tutorial Energy vs. strain calculations for obtaining more information on how to extract the converged (from the point of view of the fit) value for the derivatives of the energy-vs-strain curves. Note: To plot the energy-vs-strain curve, one can use the script GNU-energy. 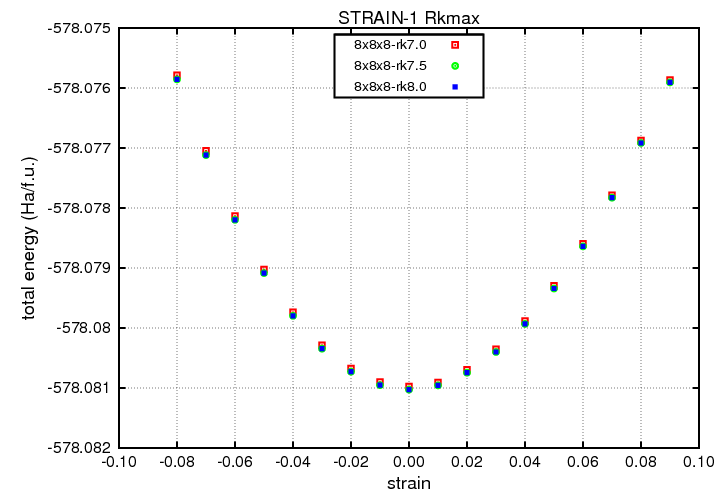 In this case the output file gnu.ps will contain the energy-vs-strain plot. The 2nd, 4th, and 6th order polynomial fit within the strain range (0.05-0.08) exhibit a plateau values around 160.7 GPa, which can be considered the converged (from the point of view of the fit) value of C11. (x) Experimental values are taken from the Landolt-Bornstein tables. Conclusions: The 8x8x8 k-point mesh for Si in the diamond structure is OK for the elastic constants, the largest deviation from experimental values is of 5% for C44. Conclusions: The increase of rgkmax to higher values than 7 does not affect both the energy-vs-strain curves and the value of C11. Conclusions: The values of the elastic constants are converged already for an 8x8x8 k-point mesh. The deviation from experiment is less than 4%.